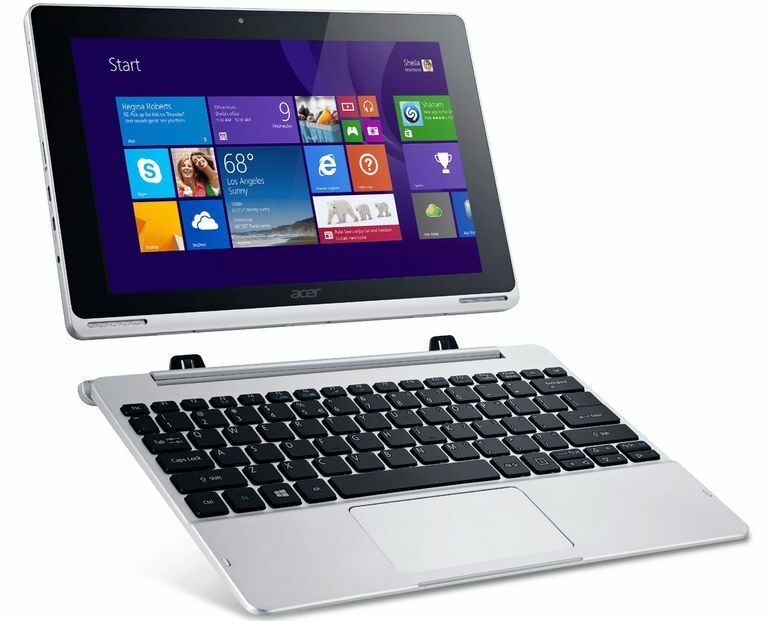 May 13, 2015 - Acer's entry in the 2-in-1 market provides a very functional tablet that can also convert into a tablet system. Its small size obviously means that there are compromises to it compared to a hybrid laptop but those knowing these limitations may be surprised at what it has to offer. Just be warned of some issues with weight distribution in the docked modes. 10.3" x 7" x .4" @ 2.58 lbs. Powering the Switch 10 is an Intel Atom Z3735F quad-core mobile processor. This is a relatively new processor that is designed for low power designs like tablets and does not require active cooling making it a perfect choice for the design. This means it does have less performance than a standard hybrid laptop that folds between a laptop and a tablet mode and uses an Intel Core or Pentium dual-core laptop processor that have fewer cores. It still is perfectly fine for streaming media, browsing the web or some light productivity applications. The processor is matched up with 2GB of memory that cannot be upgraded which means it has limited multitasking capabilities. Storage for the system is handled by 64GB of internal solid-state storage rather than a traditional hard drive. Now generally SSDs are faster than traditional hard drives but this uses an eMMC interface which limits it performance so don't expect super-fast access. This is a very small storage amount meaning that it has limited space for applications and data files thanks to the Windows operating system. Users will probably need to have some external storage with them or have this as a secondary system and rely on cloud storage. The tablet portion features a microSD slot for adding additional space through the popular flash media card. There is a microUSB 2.0 port on the tablet and a full-size UBS 2.0 port on the keyboard portion but neither of these is the faster USB 3.0 which limits the performance of an external hard drive. The 10.1-inch display for the Switch 10 uses a 10.1-inch IPS display panel. This means that it offers a nice level of color and wide viewing angles. The only downside here is that it uses a lower 1280x800 native resolution. This is fine when comparing it to many laptops but it is much lower than similarly priced tablet systems. The Intel HD Graphics of the Atom processor does just fine handling most tasks when it comes to media streaming but it is certainly not something that would be used for PC gaming on the tablet on the go. With the smaller 10-inch size of the Switch 10, the keyboard is a bit more compact than a traditional laptop. It uses an isolated design like most of the laptops on the market and it is a decent layout but some with larger hands might have some problems with it. The plastic body also has a bit more flex in it than a traditional laptop design. The trackpad is a nice decent size and offers good multitouch and single touch tracking but it isn't as much of an issue with the touchscreen display. The internal battery for the Switch 10 is a relatively small 24WHr. This is much smaller than its competition which means it also is going to have shorter running times. Even with the power conservative Atom processor, it was only able to last roughly five hours in video playback tests. This is well short of the competition which can last upwards of eight hours with similar designs or more than ten with dedicated tablets. The primary competitors are the ASUS Transformer Book T100 and the Dell Inspiron 11 3000 2-in-1. Both of these designs are over a year old now and can be more difficult to find. The ASUS and Acer have roughly the same level of performance from very similar components. The ASUS gets the edge though thanks to its longer running time. The Dell offers more performance for a laptop class processor in it but it is a full hybrid laptop rather than a detachable tablet meaning it is not as portable.